I went to a party and corrected a pronunciation. The man whose voice I had adjusted fell back into the kitchen. I praised a Bonnard. It was not a Bonnard. My new glasses, I explained, and I’m terribly sorry, but significant variations elude me, vodka exhausts me, I was young once, essential services are being maintained. Drums, drums, drums, outside the windows. I thought that if I could persuade you to say “No,” then my own responsibility would be limited, or changed, another sort of life would be possible, different from the life we had previously, somewhat skeptically, enjoyed together. But you had wandered off into another room, testing the effect on members of the audience of your ruffled blouse, your long magenta skirt. Giant hands, black, thick with fur, reaching in through the window. Yes, it was King Kong, back in action, and all of the guests uttered loud exclamations of fatigue and disgust, examining the situation in the light of their own needs and emotions, hoping that the ape was real or papier-mache according to their temperments, or wondering whether other excitements were possible out in the crisp, white night. From “The Party” by Donald Barthelme. From page 105 of Thomas Pynchon’s 1973 novel Gravity’s Rainbow. 1 Gravity’s Rainbow is often (unjustly and unfairly) maligned as a messy, even pointless affair—but here’s our author speaking through the narrator, offering up one of the novel’s points—clearly, without equivocation. 3 Entropy is all—but entropy doesn’t make for good capitalism, by which our sly narrator means, Their Capitalism. The adult world needs to be organized, systematized, caused and effected. 4 Note the not-so-oblique reference to GR’s theme of stimulus-response (and upending that response). Will Postwar be nothing but ‘events,’ newly created one moment to the next? No links? Is it the end of history? 6 Pynchon reiterates his thesis. 7 Note that organic (entropic?) markets fall outside of Their System—y’know, Them—the Professionals—these organic (chaotic, necessary) markets must be labeled “black” (preterite?). Page 105 of Gravity’s Rainbow “happens,” more or less, in 1944, in the middle of an extended introduction of Katje Borgesius, a Dutch double agent. (Or is that double Dutch agent?). The propaganda poster above strikes me as overtly racist, but also seems to nod to King Kong (1933, dir. Cooper and Schoedsack). Gravity’s Rainbow is larded with references to King Kong, a sympathetic but powerful force of entropy, a force against the Professionals. 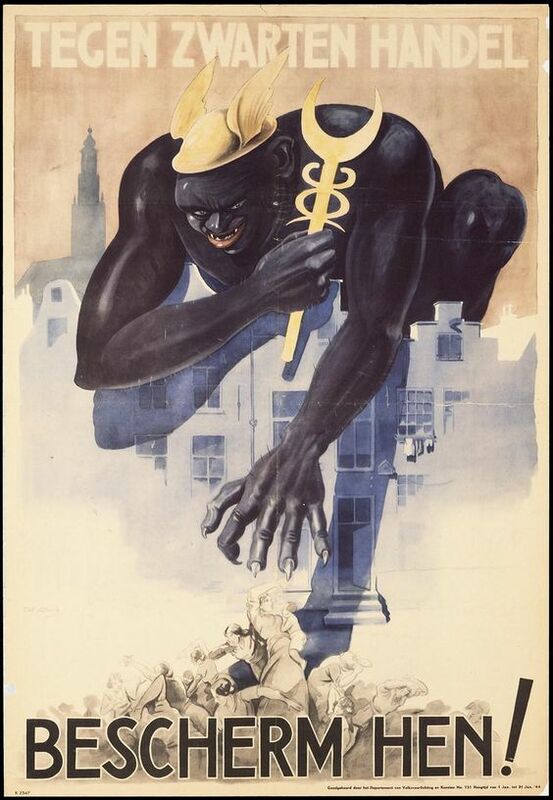 The Kong-figure in the Dutch propaganda poster seems to wear the petasos (winged hat) and wield the caduceus of Hermes or Mercury—god of thieves. But also god of the market, of commerce, merchandise, all things mercenary. It was widely believed in those days that behind the War—all the death, savagery, and destruction—lay the Führer-principle. But if personalities could be replaced by abstractions of power, if techniques developed by the corporations could be brought to bear, might not nations live rationally? 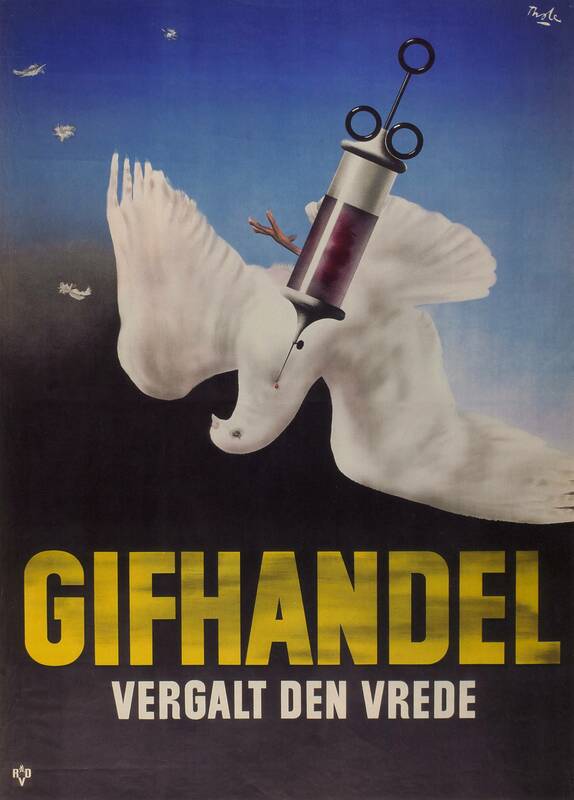 One of the dearest Postwar hopes: that there should be no room for a terrible disease like charisma. All signs seem to point to No.